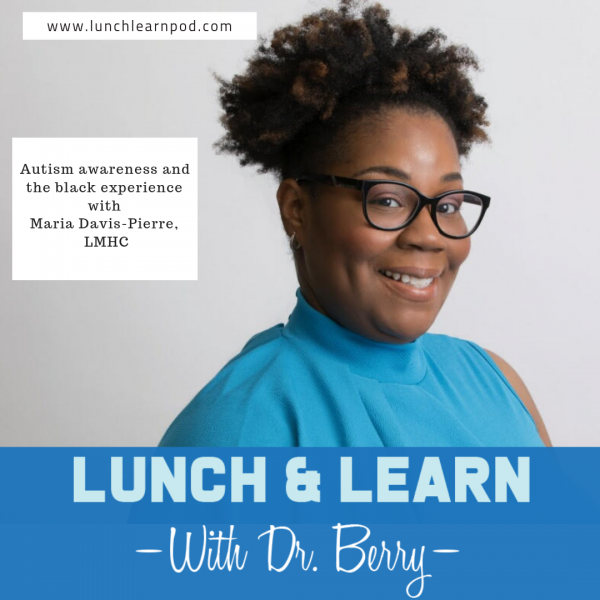 On this week's episode of the Lunch and Learn with Dr. Berry, we have a three time returning guest to the show, Maria Davis-Pierre to talk about Autism Awareness month and why she decided to take her passion for Autism and help black families. 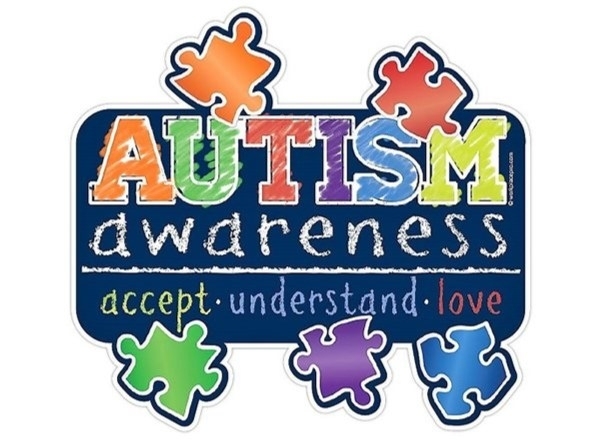 April is the month where we highlight Autism Awareness nationally and and as a father of an autistic child it hit closer to home the importance of knowing, diagnosing and early intervention. On this episode we talk about the importance of early intervention, growing up as an autism parent and why she decided to focus on black families. 1. Is Autism awareness month needed? Like with most things in healthcare early intervention is key. I remember when my daughter was first diagnosed how much work my wife had to put in to practically beg for services to be started. Because she was considered too young for the diagnosis we had to go through much more hurdles to get the care we need. The early intervention has been nothing short of life saving when I think about where my daughter is now compared to where she was before getting her started. This is why this month is so special because I know that autism awareness will help some parent or child get over the hurdle that is placed before them on this lifelong road. Alright, Lunch and Learn community, just amazing intro from today's guest. She is almost like a regular on the podcast. I think it's gonna be her third episode here in the podcast and I figured what better month than to bring it for autism awareness month, to bring Maria Davis-Pierre here who of course you know, my wife and also the CEO of Autism in Black and and she gonna tell you a lot about that. We gonna catch up a lot of people on just what autism is. Coming here, take on, we gonna pick your brain on today show. So again, Maria thank you for joining the podcast again. Thank you for having me. I’m so excited to be here. Oh, yes. Again, so for those who this may be the first time listening to the podcast. If this your first first time listening make sure you subscribe and leave 5-star review especially if Maria does a good job, right? So if this is your first time in the podcast or this is your third time listening to Maria on the podcast. May you tell a little bit about yourself just something that wasn't in the bio but something that you know people need to know. So I'm in first, in South Florida. I owned Autism in Black and Autism in Black is all about bringing awareness to the black community when it comes to autism. So we support black parents who have autism children. We also train professionals – healthcare professionals on being culturally competent when it comes to the black visibility community and of course we have a six-year-old who is autistic. A six-year-old little girl, so that is what started the road to Autism in Black, I would say. Perfect. So just for those who may not know what the month of April is to a lot of people here around the world, to give them a little glimpse of what was actually is autism and why does it like need a whole month? Autism is a neurological disorder that is characterized by difficulties with communication, difficulties with social skills, sensory and things like that. So, parents may notice that their child is not speaking or have a regression in speech. That may know their child have repetitive behavior. They may see that their child has a reaction to certain smells, textures, light, sound, things like that. And why I think it needs the whole month of being dedicated to awareness and acceptance is because especially the black community were still kind of people still don't know what autism is. So we have to shed light on what autism is and how it affects families and the actual individuals who are autistic. So I think you know that's why the whole month dedicated to it. For those who are not directly impacted by. Because for those who are directly impacted by, we know that for us is 365. But during the month of April, we ended up 10 times more just to spread that awareness, so people can be aware of autism and what it is and how it affects us enough. So they can be supportive, so that you know they can be inclusive in on things like that. If we talk a little bit about awareness, of being aware, seeing someone who is autistic that you may not realize it. Are there's certain in common issues or concerns or behavioral problems that you tend to see that may spark someone to say, hey you know what, I may need to think about autism as a diagnosis? When it comes to healthcare professionals? And then, not only healthcare professionals, because most of Lunch and Learn community would love this, on regular people just trying to better themselves and get healthier and impart themselves with some knowledge. So I would say that there is not going to be one tell sign that is going to notify someone that the person is autistic. Autism is a spectrum disorder. So what that means is that it's not a linear thing. Everybody, it affects everybody differently, and no two people are the same. So why I can say from my child, you may notice sensory things with her or her repeating certain words that you're saying to her, not every person who is autistic may have those things. So I would just say when you're with anybody, to make sure that you are being kind and being inclusive, regardless of what you're noticing with them. Alright, and you gonna touch a little bit on it because I know a lot of times when you hear, oh my son is autistic, my daughter is autistic. That's not like a one-size-fits-all thing. When we talk about autism, you didn't come to mention it as a spectrum disorder. Like what are some of the varieties, of weight varies from one into the other? I mean, in many different ways. In the professional world, they have terms like higher functioning and lower functioning onto them. So you're higher functioning with is what would be “Asperger”. Even though the term “Asperger” is not used anymore but I know a lot of people may be familiar with the term “Asperger”. So that would be watch parenthood or they watch the good doctor that would be somebody who would be considered higher functioning Asperger. And there's lower functioning type that may need more assistance with independent living skills. You may not be able to verbally communicate. They need to use other means of communication. So things like that. Interesting and this is something especially from the various skills, various spectrum of the disorder. This is something that they tend to pick up early, like when they're young, you kinda see when one person is leaning one way another? As far as higher functioning or lower functioning? No. I don't think that you would be able to fit on that as a younger because if there, as I always say early intervention is key. For instance, with our daughter, professionals such she wasn't going to talk. We got her interventions early and now she talks all the time so I think you know with the right tools and early intervention and services that you are not able to predict whether there be higher functioning or lower functioning because things change daily for a person who is autistic. You know, they may pick up a skill tomorrow so I don't think that were able to definitely say if a person is higher functioning or lower functioning. I personally don't like the terms higher functioning or lower functioning because a person can be considered higher functioning and still have traits of someone who is considered lower functioning, which is why I used the term spectrum. Ok. Alright. So, obviously, this is a question that you answer a million times over. When we talk about autism and autism spectrum, and the parents come to you and they asked you this question, they always say like, what did I do? Like, what was the cause that cause my child to become autistic? Like, is there any definitive causes that have been shown to be causative factor for autism? That has been down and this is mind-boggling, Lunch and Learn community. The amount of times I have to educate people on the fact that the one study that they point to and say yes vaccines cause autism, there's been like 20 to say no it doesn't, but no one seems to read the 20 or talk about the 20 seem to only talk about the one that we were even shown to be false and lies associated with it. So very interesting. And of course, I think that's a question that all autism parents get, the question at all care workers to take care of kids who autistic receive like what was there something I did versus, was the drink?, was medication?, was the vaccines?, whatever. There is always, they are always looking for some way to point fingers. Okay, that's how much I to say and I'm not sure if it's more, I'm not sure in your line of work, you seen it. If it's more, they try to remove some of the burden of it? Maybe they feel like burden that their child is autistic or what would you say? Necessary say the word burden, burden is trigger word for most autism's parents and autistic individual I think, trying to find an answer is something that we all look for when it comes to being a therapist. When people have red flag and find the symptoms of most any diagnosis and they get the diagnosis. You know, they had the answer to, you know, the way their feeling with autism is just so much great area and people want an answer. They want to know why we can't give them a reason why also takes away some of the shame and guilt that goes along with being a parent to an autistic child because you feel a lot of the shame and guilt like, what did I do wrong? If they're saying, did I eat something wrong? Did I do something wrong? Maybe I should haven't on road, on this bike at that one time. You know, things like that. So having a definitive answer, can kind of ease that shame and guilt that you feel as a parent because you know a lot of times we watch the struggles that our children go through and how people perceive our children and that's something that constantly trying to battle and bring awareness and inclusion and acceptance to. So I think that is what it boils down. Ok, especially, and a talk and good read and write because you talk about acceptance. So you kinda figure that, you know what, like my child is autistic. I’m doing what I can, but there's clearly a void that's needed and there was no one calling so you picked up the call and say, okay, I'll take dismantling, I'll start organization like Autism In Black. What was some of the motivating factors behind it and what help you keep going? I think for me, having professionals come into my home and never taking our culture into consideration. Thinking that their cookie-cutter approaches were just going to apply to us as a family, when culture is so big to us, as African-American, as Caribbean individuals. If it's kind of what we hold onto and we all know that our culture can affect any treatment outcome. So if you're just trying to apply the saying interventions across the board without taking cogent considerations. More than likely not gonna be successful. So having the saying perfection will come in, not take that into consideration and seeing that it just wasn't with me and I was with other parents who have autistic children saying that they didn't take us into consideration as parents, as individuals who are with our children a lot more than they are and not to talk to us or consider us. So those are, where the two motivating forces and starting Autism in Black and starting something for black parents. Because I mean, anytime you looked up autism, you're not seeing faces that look like you. So to see somebody who looks like you who understands not only the professional but the personal side of it, is what keeps me going. Love it and when did you start this company? How long has been around? And what is your plans? What's the end goal? So it's officially been and its own business for a little over a year. I officially started it last January but I had been doing the work in my other private practice. I just separated it officially in January. I think the next plan for Autism In Black is most definitely, to expand. We definitely are trying to open a wellness center, open summer camps for children and you know continue to spread awareness, accept, acceptance and inclusion. Love it. Love it. Love it. So, when some when say, you know what, my child maybe autistic, or maybe they already diagnosis of autism, but I'm still having trouble navigating the system. What are some of the services that you offer? So I offer parents coaching that is for any parent who has autistic child. No matter where they are on autism journey and they’re looking for, you now, how do I navigate the school system or you know, what resources are out there for me or how do I set up t goals for my child. I also do couples coaching, because, as we know, having a child with especially, disability can definitely impact your relationship. So I also do couples coaching to help you set the foundation again and get back on the same page. I offer IEP services and any autism parent caregiver will let you know that IEP is so important. It is something that they get from K-12, is the individualized education plan. It has a list of goals that the child worked on annually for the school year. It is a legal document. It's the most important document they have from K-12. So I offer IEP reviews to make sure that your child's IEP set up for them and who they are currently realistic for them. I also do trainings on what autism is and how to speak to your family about what autism is and how to set boundaries with your family regarding your child autism. Because we know a lot of times that families don't quite understand and it's hard for us to set those boundaries with family. So those are some of the services that Autism in Black offers. Now, have you found it difficult working with families whose child is autistic in terms of not only helping to, either create or mean a relationship between the parent and child, but also help mend the relationship that may be called away from when regards to the parents. I don't think so. I think that being a parent myself, I kinda already have an upper hand in it, so not just having the professional side of it but the person side of it. Being able to know exactly what they're talking about. Gives me upper hand, the interventions and skills and tools that are used in session. So I think that for us, a therapist. You know, we have a certain sense of dealing with resistance or dealing with things that come up. So I think for us, is not more, it is difficult to just will get, when we get there, type of thing. The goals will be accomplished. And before we let you go. You kinda hint to that, you also offer not only on one-on-one but you also do some coursework as well. Can you tell us about it? Yes. I offer two courses currently. Both IEP courses. One is for mental health professionals and healthcare professionals on how to advocate for their clients with IEP's and how to go to meetings and make sure their clients are getting the goals and the services and modifications and accommodation they mean. Then I also offer the parents IEP course. The parents and caregivers IEP course that helps them to learn how to best advocate for their children in the school system. How to make sure that their child's IEP is specialized for their child. How to advocate for certain services and accommodation and notification. I know you kinda, a little bit, some of the services that, especially that when you do like these IEP reviews. Is there commentaries that you see that sometimes parents don't take advantage of it, because they didn't even know that it is out there? Don't received but I think that parents are not aware of everything the children could receive. I think that they listened a lot of times to just the school saying No, your child isn't qualify for speech or they don't qualify for occupational therapy or physical therapy or they say something to the extent of, well we don't have the means to cover that service. And parents just say okay, not knowing that, you know, there's a whole lot that IEP law, that protects their children to make sure that the children get the services that are supposed to get. So I don't think it's that they're not getting one specific service. I think your services across the board that they're not getting full time for or just not receiving because they don't know that their child actually qualifies for. So, a couple questions, before we let you go out of here. What is it that you would like black families to do if they suspected there child is autistic? I would like them to take their child into either a developmental pediatrician, a child psychologist or a child neurologist and get their child evaluated to grieve and take the process that they may need to. Because they need to understand that it's not gonna work if they're not hundred percent on board. Because the parent, especially for those who are under 18, is, you know, a crucial part in their child being successful. They don't fully believe or understand or are in the now and the child is not to be set up for the success that they could be. So deal with your emotions and take your time and do what you need to do, but know that your child needs you a hundred percent in, for them to be successful. Perfect. Where can others find you? I know you talk a lot about, what you do. You talk a lot about, some of the stuff that you offer from the service standpoint. But if someone is looking, listening to the podcast and have a family friend or themselves that have a child who is autistic. Where can they find you to get some help in some consultation work? You can go to my website: www.autisminblack.org. You can find me on Instagram, Autism in Black. My email is info@autisminblack.org. And I'm also on Facebook at Autism in BLK. Alright. I love it. So again, Lunch and Learn community, let's give another round of applause. I think, it is the 3rd or 4th times. She probably get tired to coming here, but I usually have to beg because Lunch and Learn community need to know about autism and I when I talk about autism expert's right? How can I not talk to my wife, She is an expert, right? So it's only right to get her on the show. It's only right for a repeat. Yes after good, they're good and she's a good one and continues to drop gems here for autism awareness. It's not only, its autism awareness, of what was the? Awareness and acceptance. They are moving more towards acceptance, which of course, autistic individuals want. But I think for a lot of community, especially the Black communities, the Spanic communities. They still need the awareness portion of it because we all know, we can't move to acceptance and for not aware of something. That's where Autism in Black comes in to make people aware. Exactly. And I think for certain communities, we still do need to provide that awareness, but they're moving more towards acceptance because of course you know, autistic individual want to be accepted and who doesn't want to be accepted? You're right. You're right about that. So Lunch and Learn community, thank you for sticking with us for another amazing episode. And I wanna see you guys next week. Maria, thank you for joining here on Lunch and Learn.